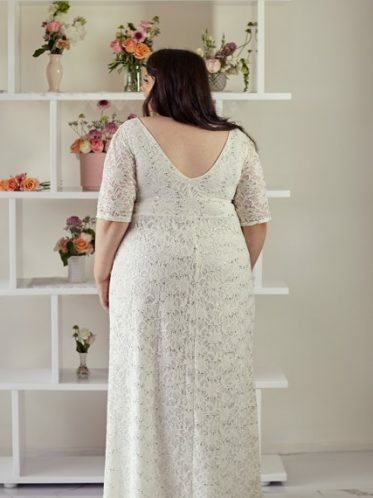 Soulful and boho is how we would describe the Paige plus size bridal dress with sleeves. 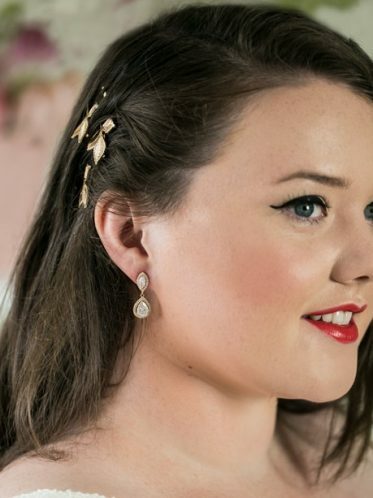 For the woman who lives simply yet sophisticated and doesn’t want to change her ethos on her wedding day. Instead she wants to remain free spirited – comfortable in her own skin and in her wedding gown. 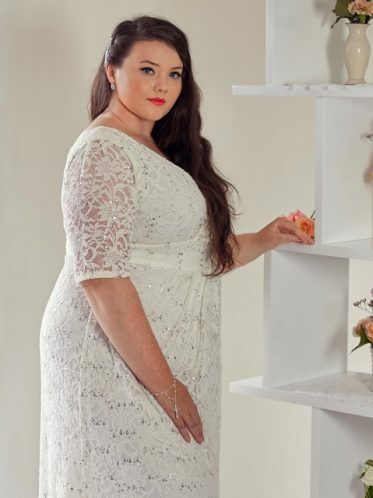 Created in an ivory stretch satin with sequinned lace overlay, a V-neckline, empire line, Aline skirt with sleeves combined to make this dress fall perfectly around any figure from size 16 to 36. We can remove the stretch sleeves to become sleeveless depending on your preference. 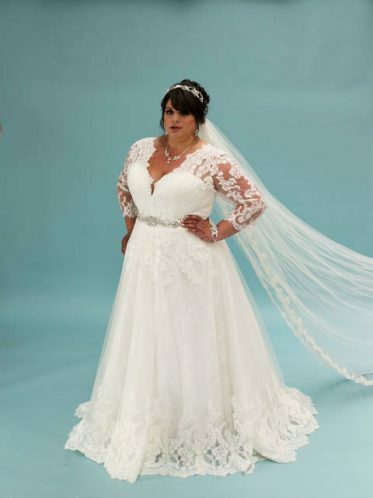 This plus size wedding dress with sleeves is so subtle that it can be nicely accessorized with silver wedding jewellery. Especially a necklace that is going to compliment the deep neckline. The perfect style can be found in the Tear Drop pendant necklace or the Sophia earrings in gold both available at our Melbourne boutique. The Flirtatious necklace comes with matching earrings, pictured, a combination which might be all you need with this sublime gown. I love matching gold jewellery to the rich ivory colour of the dress. An off the rack gown. Paige is available in store to purchase off the rack now in sizes 16 to 34. If you cant make it into our bridal shop. That’s OK send your bust, waist and hip measurements and we will send it to you on line. Keeping with the less is more theme, unadorned, comfortable shoes will suit the dress and the woman who wears it. A free spirit can surely let loose on the dance floor in these Beth flat wedding shoes. Possibly a lace ballet flat, then our bestselling Yvette lace wedding shoes are the most comfortable heel you can imagine. To ensure your complete comfort in your dress, we are happy to offer on-site alterations by Ginger pins. Please inquire in store and we can give you an idea of our services as well as an alterations price list. 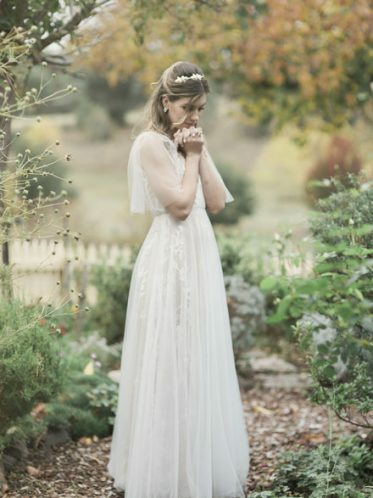 Paige long wedding dress with sleeves is priced at $599. Just one of the many long sleeve wedding dress styles only available from Leah S Designs.